The feature at Sha Tin on Saturday (23 December) may have been the Griffin Trophy, but runaway victor Win Beauty Win was quickly overshadowed later on the card by two other three-year-olds in Hot King Prawn and Exultant. The common thread linking all three winners, though, was not just their age but their jockey, with Zac Purton in the plate aboard all three winners. 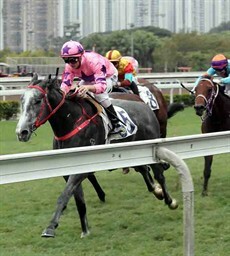 The John Size-trained Hot King Prawn remained unbeaten, winning his fifth consecutive start over the straight 1000m at his first Class 2 attempt in the Chek Keng Handicap. Size has been reticent to throw three-year-olds into Class 2 in the past, especially this early in the season, but Hot King Prawn flashed his potential as the grey gelding produced a display of sustained speed to score by a length and a quarter. The margin was his smallest to date, but his trainer believes that was to be expected. “It’s Class 2, you just can’t put them away as easy,” Size said. “It’s a different grade and he’s a living example of what happens. You just can’t look so good when you go up to Class 2, they can all gallop and it’s that simple. I didn’t expect any more from him today, he had to beat off a tough one in Pablosky and then they all had their chance to beat him. Size suggested that Hot King Prawn was unlikely to be seen on the racetrack again until May at the earliest. Possibly the day’s most eye-catching victory went to Tony Cruz-trained Exultant in the Class 2 Long Ke Handicap (2000m), with the Irish 2,000 Guineas placegetter stamping himself as a leading BMW Hong Kong Derby contender. Formerly named Irishcorrespondent, the soon-to-be four-year-old had caught the eye in two Class 1 efforts over 1400m and 1600m and he was sent out a 1.8 favourite for Saturday’s contest. After overracing near the rear for the first half of the race, Purton produced him with a long, looping run around the field and the bay stretched clear for an effortless two and three-quarter length success. Cruz was not on track, but owner Eddie Wong hopes that Exultant might be his best galloper since 2006 Hong Kong Sprint winner Absolute Champion. 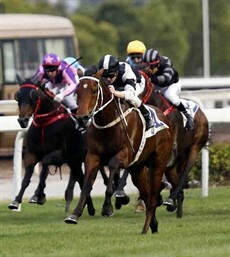 The Hong Kong Classic Cup (1800m) is run on 18 February, with the BMW Hong Kong Derby (2000m) a month later on 18 March. They are the final two legs of the Four-Year-Old Classic Series, which begins with the Hong Kong Classic Mile (1600m) on 21 January. However, while Purton believes Exultant has the class to figure in the classics, he believes the son of Teofilo needs to figure out his racing manners if he is to reach the very top of the Hong Kong tree. Elsewhere on the card, jockey Keith Yeung returned from a month-long injury-enforced break to score a double aboard Almond Lee-prepared pair Sum Win Dragon and Namjong Plus. It was also Lee’s second double within a week. Italian rider Alberto Sanna also scored the first win of his current contract aboard Derek Cruz-trained Bossiee in the Class 4 Tai Long Tsui Handicap (1200m) and later made it a double when weaving a passage aboard California Joy in the closer, the Class 3 Pak Tam Au Handicap (1400m). 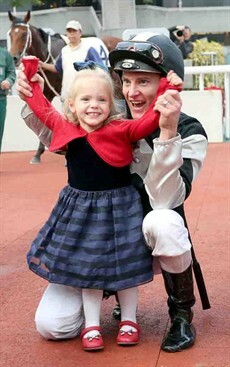 Zac Purton celebrates his treble, culminating in his win aboard Exultant, with daughter Roxy in the Sha Tin winners’ circle. Hot King Prawn remains unbeaten from five starts in the Class 2 Chek Keng Handicap (1000m), with Zac Purton once again in the saddle. Exultant stakes his claims for the Four-Year-Old Classic Series with his impressive victory in the Class 2 Long Ke Handicap (2000m) under Zac Purton.